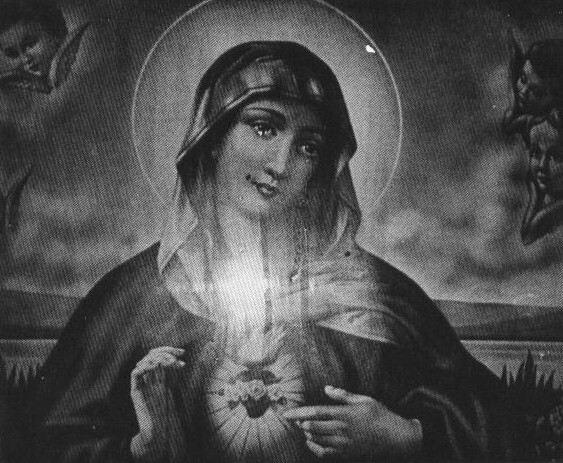 Tag Archive | "Blessed Virgin Mary"
Years ago, a good friend of mine, born into the Jewish religion and open to all faiths, advised me never to negate “the power of Mary.” She was referring to Mary, the mother of Jesus. Dan Brown’s* feminist spin on early Christianity notwithstanding, I’ll confess that I had never really prayed to Mary. I tended to go straight to the top: Jesus, God the Father, and in later years, The Holy Spirit. Mary was always the woman behind the throne, if you will, the quiet, humble figure in a familiar blue mantle or black mourning robes, after the crucifixion of her Son. As a child in Catholic school, Mary was openly celebrated on one day and one day only, during the month of May. On that day, I was allowed to ditch my drab plaid uniform and don a pastel dress as well as a crown of faux flowers. My classmates and I — indeed, the entire school — attended a Mass dedicated to Mary, punctuated by special hymns sung in her honor. Truth to tell, I had always viewed that day as a sort of May Day, not so much a religious celebration than a harbinger of the summer that could not come fast enough. Several years ago, a relative gave me a very special prayer to Mary, which she swore had never failed her. I didn’t give it much thought until another relative handed me the same prayer. Finally, a friend of mine, not the Jewish lady, shared that this prayer had truly helped her during a family member’s grave illness. It is to be said for three days in succession. As I understand it, the prayer is to be reserved for dire circumstances or very special intentions. In other words, this isn’t your every day prayer. It is to be said with focused intent, and it has been said never to fail. When the special grace has been granted in the name of Mary, the mother of Christ, the recipient is to publish the prayer. So, here I am now, with the prayer. It worked for me. Oh, Star of the Sea, help me show herein, you are my Mother. Oh, Holy Mary, Mother of God, Queen of Heaven and Earth! I humbly beseech you from the bottom of my heart to succor me in this necessity. Oh, show me herein that you are my Mother. Holy Spirit, you who solve all problems, light all roads so that I can attain my goal. in all instances in my life You are with me. You confirm once again that I never want to be separated from You in eternal glory. When I was a child, my dad had a habit of conscripting me into small conspiracies that always put a smile on my face. The fact that he always left my sister and mother out of the equation made every secret rendezvous all the more thrilling. Before I’d entered the first grade, I’d developed a problem with one of my eyes that, if not corrected, would have required surgery. Every Saturday morning, one of my parents took me to my appointment with a gentle ophthalmologist who, in a dark room, shone a penlight into that eye to see how it was faring. The minute my mother had waved us off, my dad hailed a big yellow taxi and ushered me quickly into it. My mom didn’t believe in cabs. Considering them unnecessary luxuries, we’d wait on the street to board two buses whenever it was her turn to take me to the doctor. The ophthalmologist’s office was situated in Brooklyn, New York, toward the tail end of Flatbush Avenue — directly across the street from the Prospect Park Zoo. After every appointment, my father would swear me to secrecy as we entered the park and walked the long incline down to the zoo. We’d clap back at the seals honking and frolicking in their watery enclosure. We stood back from the polar bears’ cage and eyed the huge beasts with respect, for one of them had amputated the arm of teenager foolhardy enough to stick that arm through the bars. We munched Cracker Jack from red and blue cardboard boxes, where the prize was always buried too deep for my sticky little fingers. Long before the problem with my eye had emerged, my dad had already introduced me to this verdant area of Brooklyn. The front entrance to the Brooklyn Botanical Gardens lay on the same side of the street as my doctor’s office. One Easter Sunday, when my sister was four months old and I, two and a half, my father took me straight from church to the Botanical Gardens. I hunkered down at the lily pond, my dad explaining how the plants grew in water. I think I was more mesmerized by my reflection in the pond. I remember the tiny white straw handbag that I carried, adorned with small faux violets. Years later, when my sister and I were teens, my family walked the entire length of the Botanical Gardens and it was quite a walk. Characteristically, my sister grumbled all the way and my mother muttered about the housework that was going undone as we communed with nature. My father and I ignored them and walked on, enchanted, in particular, by a dirt trail running beside a tree-lined brook. Here were no carefully manicured flowers or shrubs bearing small metal plaques with their Latin names. Here was only what God had made. And so, my father and I stepped lightly, reverently through His works. When we broke free of the brush, we came upon an open field where cherry blossoms were in full bloom, their soft pink petals a gorgeous contrast against the rolling emerald green grass. Just beyond them lay Eastern Parkway and the Brooklyn Museum, where my dad had tried many times in vain to stop me from ogling the 3,000-year-old mummies nestled, like Russian dolls, in their wrappings, their sarcophagi, and their glass cases. He didn’t want his daughter exposed to death, but I’d been born on Halloween and gravitated to things that went bump in the night. The Christmas that I was five, my dad made the mistake of dressing up as Santa Claus. Let me amend that. He made the mistake of smoking one of his signature White Owl cigars before donning the red suit. Santa did not come down the chimney; he walked up from the basement … redolent of cigar smoke. I looked up at him with his face obscured by the snowy beard and cracked, “You’re not Santa; you’re my daddy!” “Why, little girl, what makes you think that?” Santa cried. “You smell just like his cigars!” If the cigars didn’t tell the tale, his laughter did. My sister was too young to get it, but my dad never took a chance again. That year was the first and only time that Santa deigned to pay us a visit. A year later, on a night approaching Christmas, he whispered to me to bundle up; he said there something that he knew I’d like to see. I don’t remember where my mother was, but I do remember sneaking quietly out of the house, for she would not have taken kindly to her child being exposed to the chill night air. All along the avenue we walked, past our neighborhood and into my Aunt Connie’s, and then, past that. The air was crisp and quiet; we huffed just to see the breath dance before our faces. Little traffic passed us, for on such a night, most people were snug inside their homes. In the dark, Christmas lights glowed within and without those homes — simple, teardrop shaped lights that burned in red, blue, green, and yellow. In the early 1960s, elegant electric icicle lights had yet to be invented. There were no pink or purple bulbs, no overblown plastic Santas or snow globes on front lawns, and no houses so wired up they could be seen from Mars. All we had — all anyone had — were those simple red, blue, green, and yellow bulbs strung on pines trees and wreaths and draped around doorways. The colors alternated along their wires and never deviated: red, blue, green, and yellow, red, blue, green, and yellow, red, blue, green, and yellow. That night, it seemed as if my dad and I had walked for hours. It was cold and my little legs were tired. I don’t know how many times I demanded to know where we were going and when we were going to get there, but my dad just said patiently, “Soon, soon.” Finally, we turned off the avenue and onto a side street. Our destination was a house decorated, miraculously, with blue Christmas lights, just blue. 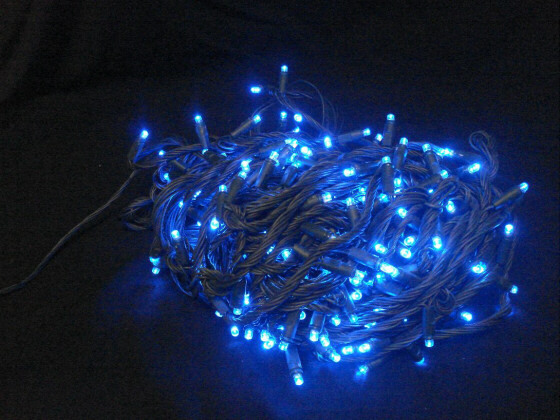 There were no red, green, or yellow lights, and the blue was a different hue than the usual bulbs. Click the font color option in Microsoft® Word, select the brightest blue, you’ll have a notion of what that color looked like. But even Bill Gates and all his geniuses couldn’t do that color justice. Around the doorway and windows of the otherwise darkened house, the rich blue blazed. And on the front lawn stood a large stone grotto with a statue of the Blessed Mother in her signature sky-blue robe. Blue lights arced over the grotto, glowing like embers in the dark. So unexpected, so beautiful, and so peaceful was that scene that my whining tongue stood still. With our hands jammed into our pockets, my dad and I exchanged not a word. Time seemed as frozen as the air. It was he who finally asked if I were ready to go home, for I could have stood there all night, soaking in the most amazing color and the utter serenity in what was then the fourth largest city in the nation. On every private outing before and since, it had been just the two of us: just my father and me. But that particular night, we shared with a co-conspirator. We shared a silent, spiritual moment with the soul who, in humility, ducked backstage the moment that a long-promised Savior entered the world. We shared that moment with the woman chosen from among all the women on Earth to bring Jesus Christ to a world long awaiting peace.